Marvel's Agent Carter one shot featured Captain America's love interest from The First Avenger tracking down a mysterious serum in 1945, one year after the Captain's apparent death. 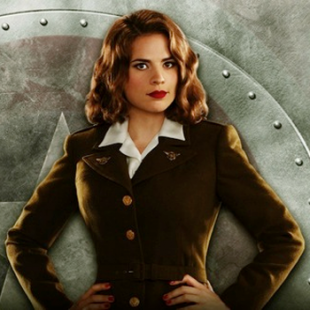 Agent Carter, the upcoming television series spun off from that short, takes place very soon after that, in 1946. But if things work out the way the ABC series' writers and producers hope, then Agent Carter is going to play around throughout the title character's life, rather than sticking to a straight, linear narrative. Think George Macdonald Fraser's Flashman novels, if they were about someone inarguably good instead of craven and awful. Fraser's Flashman series, which followed the adventures of a cowardly and villainous British soldier and spy, is notable for dropping in and out of the title character's life at different points - to read them in publication order is to skip decades at a time with the only logic being what the author found interesting. As Agent Carter explores the history of SHIELD which, we all know, will eventually be disbanded thanks to having been infiltrated by HYDRA from its inception, the series apparently may choose to follow Fraser's lead, and tell different stories about that history at different points in Agent Carter's life. That interesting possibility was hinted at this afternoon during a press round table event held immediately after today's Marvel Television Comic-Con panel, by writers Christopher Marcus and Steve McFeely as well as by pilot episode director Louis D'esposito. The series has been greenlit for eight episodes, scheduled to air late this fall during Agents of SHIELD's winter hiatus. As such, these episodes are currently being written with a single, serialized arc in mind. However, if the show is a hit, so McFeely told us during our conversation, they are already considering other tightly focused arcs that could conceivably happen at any point in Agent Carter's career. "Some stories," Marcus said, "could take place in the 50s, or the 60s." As Marvel Television's Louise D'Esposito also confirmed their thoughts in this direction, explaining that the focus on agent Carter as a character, as well as the freedom to dig into the history of the Marvel Cinematic universe prior to what was seen in Iron Man, affords them a lot of creative options. However, all of them were careful to stress that this is only a conceptual idea. The show has only just gone into production and so the focus is on the eight episodes currently greenlit. Still, the fact remains that the basic idea is for a show that explores the history of SHIELD in its earliest days, through the life of the series' title character, in a way that eschews a traditional linear through-line. Like I said, cool. We were also able to chat with the series' showrunners, Michelle Fazekas and Tara Butters, who hinted at their own complimentary ideas for the show. In addition to suggesting they're interested in exploring the state of being a woman during the postwar period (a time when millions of women were laid off to make way for returning veterans of World War II), they also admitted that they're thinking ahead to possible ties between Agent Carter and Agents of SHIELD, besides (of course) their airing on ABC and existing in the same universe. "We've actually talked about that," Butters said, noting that "it would be cool to see easter eggs," then revealing that they're also tossed around the possibility of introducing plot points in Agent Carter that pay off later on Agents of SHIELD. Of course, it has to be restated that this is still extremely early in production, and at the time of this writing only the pilot episode has been written. Loose talk at conventions often doesn't end up panning out later. Still, it's interesting that this early on the production is considering mild experimentation with format and further, is thinking in terms of serialized rather than episodic television. Here's hoping this isn't just so much jabber.